Well, folks I’m in a mad dash to clean out my refrigerator and pack up for our trip to Missouri to visit family. We’re gearing up for flying with a hyperactive toddler. I’m tempted to pack my boxing mouth guard in my carry on since Penelope has quite the penchant for head butting when she isn’t free to do as she pleases. We’ve only got two days left before we leave so I’m trying not to buy any groceries. This has led to me being an involuntary vegetarian until we leave. I went a little over board when I saw the fresh veggies at the market late last week and now I’ve got to hurry up and eat them before we leave. I bought a ton of zucchini because they were beautiful and on sale. 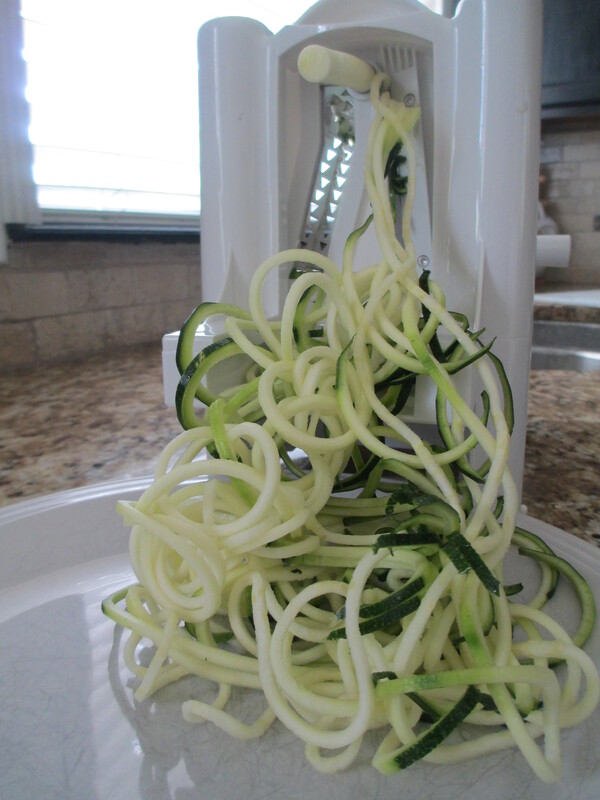 I wanted to use my zucchini spiralizer that I bought on amazon but I hadn’t played with it yet so I was a bit timid about it. For lunch I decided to give it a shot. I kept looking for recipes on Pinterest but most of the recipes I found called for ingredients I didn’t have on hand. The whole point is to use up what I’ve got. I’ve been watching Master Chef on Netflix so I was inspired to come up with something of my own. I broke open the box where my spiralizer sat waiting for me to play with it. It was so easy to figure out I was cranking out some “noodles” in no time. I started off by sauteing one large clove of garlic in 1 tbls of olive oil. After about thirty seconds I added the zucchini, a dash of salt, red pepper flakes to taste and the juice of half a lemon. 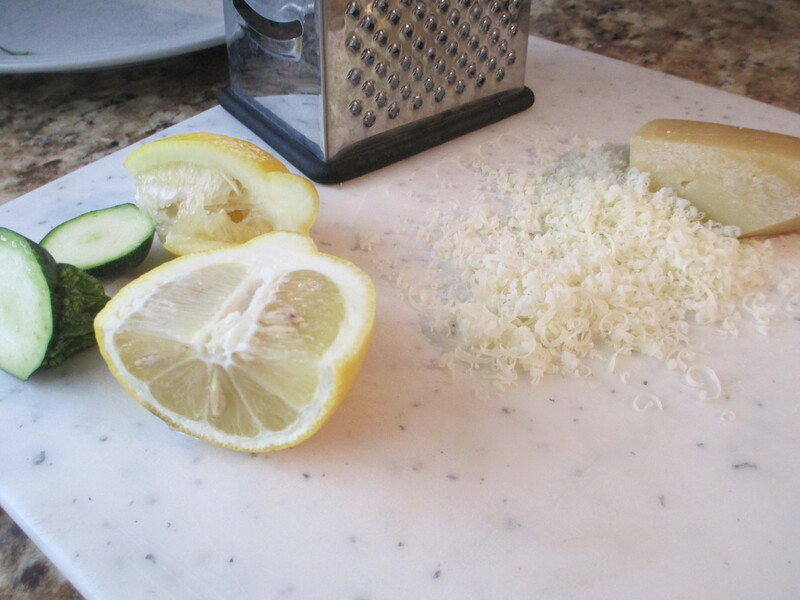 I let those flavors marry while I grated some fresh Parmesan on the cheese grater. I didn’t measure how much cheese I grated (somewhere between 1/4 to 1/2 c). I sprinkled half of the cheese while it was still in the sauce pan and gave it a good stir and the other half over the top of the noodles. It was SO good! I think I’ll give myself a little pat on the back for that one. It literally took less than ten minutes start to finish. Now I just have to figure out what to do with my baby bok choy, eggplant, sugar snap peas, broccoli… I’ve got a lot of eating to do. I’m seriously debating on skipping my cleaning/packing plans to make these. They look so chewy and delicious! Okay enough procrastinating… I’ve got work to do! those both look delicious! 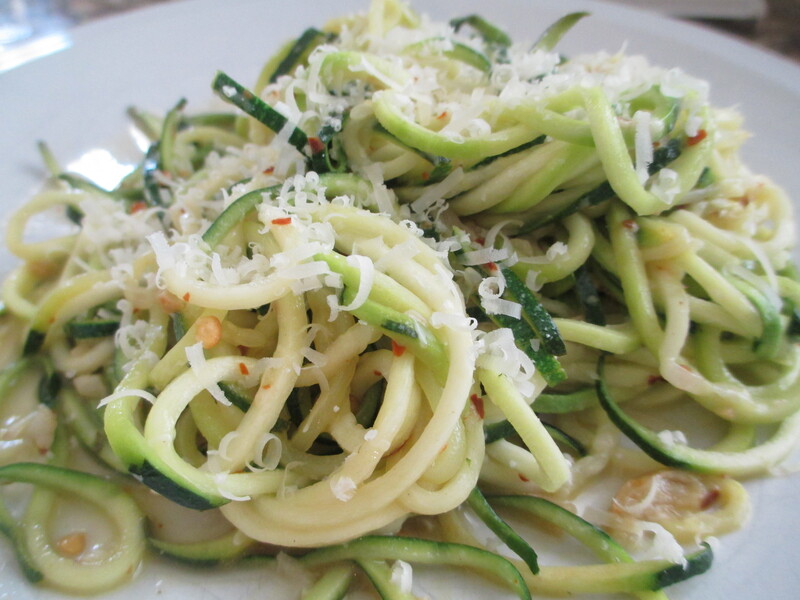 I love zucchini noodles in place of pasta, it’s wonderful! Those zucchini noodles look delicious!! I pinned it to try (except I don’t have that cool spiral thing) – I will have to be creative! 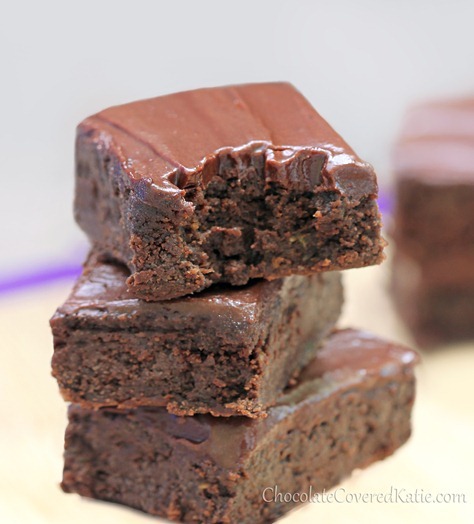 I’m thinking you should make a stir fry with your leftover veg, and then eat those zucchini brownies for dessert. And you should definitely invite me over for dinner. I’ll hop on a quick plane over. I’ll be trying this tonight…thanks for posting!! I have been on the fence for a long time about ordering one if those tools. After reading this I had to get one…it is the deal of the day on Amazon…SCORE! Things take forever to get here (South Korea) but I can’t wait to give it a go! This was really good! I added some shredded chicken to make it more filling. The taste was awesome! Thank you! I’m glad you liked it Kristen! Hi! About how long did you let everything cook? Should the zucchini be soft or still somewhat crunchy or do you base it on preference? I would prefer a spaghetti noodle like texture, after it’s been cooked. Can’t wait to try it, thanks! I don’t mind, thanks for asking.